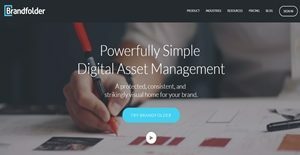 Brandfolder is a software that describes itself as the world’s most powerfully simple Digital Asset Management (DAM) application. It highlights having an exceptionally user-friendly interface which makes it much easier for users to organize, share and collaborate on files all in one unified hub. Since it is easy to use and understand, Brandfolder helps companies to be more productive. Clients are able to spend less time integrating, training, and working their way around DAM solutions with Brandfolder’s straightforward yet visually-elegant platform. Since the software is cloud-based, users are also ensured that their brand assets are safe and can conveniently be retrieved anytime and anywhere. The application is also able to provide in-depth analysis that are useful in brand building. An organization is more efficient when it has an uncomplicated and dependable DAM solution. Brandfolder simplifies file management so much that several clients are able to get the entire system up and running throughout the company in as fast as 2 weeks. Asset organization also becomes less stressful with Brandfolder’s multiple uploading capabilities and integrations with leading cloud storage providers. The service also supports a wide array of file types, has accurate metadata features, and can link media from over 300 sources around the internet. Companies can save time and resources with Brandfolder’s intuitive file management platform. Users can easily find what they are looking for by putting detailed tags and sorting files in themed or categorized “collections.” One can also indicate specific permission levels and perform bulk actions. When an employee spends less time searching for files, they are able to spend more time working. Brandfolder’s extensive search capacity eliminates the need to tediously go over computer files and cloud storage folders every time you need an asset. Its thorough metadata features present more comprehensive search results. Businesses can also use Brandfolder to assess and track how good or horribly a product is performing. The application provides in-depth analysis to discover how the assets are being used, who is using them, and so much more. These information can help organizations with regards to marketing and strategy-building. If you are considering Brandfolder it could also be beneficial to analyze other subcategories of Best Digital Asset Management Software listed in our base of SaaS software reviews. Since each enterprise has unique business needs, it is sensible for them to abstain from searching for a one-size-fits-all ideal software system. Needless to say, it would be useless to try to find such an app even among market-leading software platforms. The clever thing to do would be to jot down the various essential elements that need consideration such as main features, finances, skill levels of workers, company size etc. Then, you should do your groundwork thoroughly. Read some Brandfolder reviews and look into each of the other systems in your shortlist in detail. Such comprehensive research can ensure you weed out ill-fitting platforms and select the solution that offers all the elements you need for business success. How Much Does Brandfolder Cost? The vendor offers custom pricing (quote-basis only). Contact the vendor directly for more pricing details and a quote. We realize that when you make a decision to buy Digital Asset Management Software it’s important not only to see how experts evaluate it in their reviews, but also to find out if the real people and companies that buy it are actually satisfied with the product. That’s why we’ve created our behavior-based Customer Satisfaction Algorithm™ that gathers customer reviews, comments and Brandfolder reviews across a wide range of social media sites. The data is then presented in an easy to digest form showing how many people had positive and negative experience with Brandfolder. With that information at hand you should be equipped to make an informed buying decision that you won’t regret. What are Brandfolder pricing details? What integrations are available for Brandfolder? Brandfolder’s public API and various integrations offer numerous options for custom applications. Integration partners include Adobe Illustrator, Adobe InDesign, Adobe Photoshop Google Apps, Microsoft Active Directory, Salesforce, and more. Pros: We managed to move all our assets (logos, guidlines, colors and typeface) to this platform and to move photography and other additional digital assets. I like that the collections are useful for access control. We look forward to use the brand monitoring feature so we can track our digital footprint and to update our company’s visual identity. Cons: I’d like to have link into Brandfolder through documents window something similar to Dropbox so we can better manage our digital assets and users. Pros: It allows us to separate channels which is life saving tool and it offers easy user-flow that is spread across the paltforms. We started using video which is essential for our marketing and social marketing team. I like that the team behind this solution constantly improve the product. We managed to switch our failures into opportunities. Cons: Sometimes the speed is slow because of the subcategories and sometimes user requests that are sent are not received by the users.